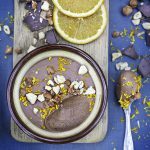 This vegan chocolate orange and hazelnut mousse is a great way to impress at a dinner party without going to too much effort. Put a chilled dish of this in front of each of your guests at the end of the meal and they’ll be talking about it for ages! 200 g dark dairy-free chocolate melted and allowed to cool.